Traditional method of learning Ashtanga Yoga with Joey Miles. Joey is an authorised level 2 teacher and dedicated to teaching this style. Ashtanga is a moving meditation that builds strength, flexibility and balance. Students are not led by a teacher. Joey will guide and adjust students individually therefore the experience of the practice becomes much more personal. You can arrive anytime and do as much or as little as you are able. Learning this way encourages the discipline of self-practice and coordinating your movements with your breath. Traditionally this is the way Ashtanga is taught in Mysore, India. 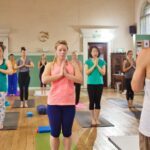 The focus of a Mysore class is to empower you to develop the practice as your own. In these classes you begin to make the transition from student to being your own teacher. Mysore classes help this transition by giving you more space to listen to your body’s wisdom, without unnecessary input from the teacher. You have the opportunity to be guided by your breath and work at your own pace doing as much or as little as you choose. The teacher is there to guide you and offer adjustments and alternatives rather than lead you. This is a very powerful way of practicing Yoga and you will find that once you begin you will really develop a deeper connection to your Yoga practice. A Mysore class develops your practice in a way that is tailored to you. Meditative and focused Ashtanga Mysore Style is transformative and liberating. Our teacher Joey Miles is one of the most highly regarded Ashtanga teachers in the UK and we are blessed to have him running his Ashtanga Mysore studio here in Leeds. Mysore Classes run between 6.30am and 9.30am which means that you can start anytime between 6.30 and 8.30am. The studio opens at 6am so you can start practice then but Joey will start teaching at 6.30. All classes are held at our beautiful Chapel on Meanwood Road. Parking is available in our car park and at the front of the building for up to 2 hours. Outside office hours you can park at the back or in the car park across the road. Please note Yoga Space Class Passes or memberships cannot be used on these classes. Please go to http://ashtangayogaleeds.com/ for more info. No booking required though it is advised that you attend an Intro to Mysore Workshop before attending this class. Payment direct to Joey or Rachel on arrival.